Andover, NJ – This month, Doobert.com volunteers drove a rescue dog over 1,000 miles from Holiday, FL to his new home in Andover, NJ. Buster, an English Setter, was found by the dog of a local hunter, unknown how long he was fending for himself. The hunter took Buster in while the search for a rescue to take him was started. Hugs for Hounds took Buster in until they found a rescue in Pennsylvania. 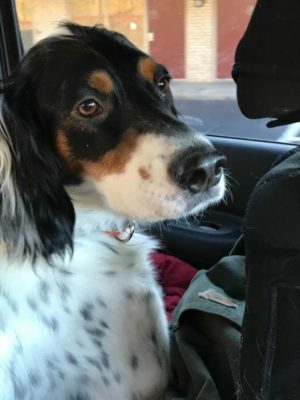 Buster was transported to this new shelter, but was then transported back to South Carolina where A Better English Setter Rescue and dedicated volunteers, pulled Buster from a shelter where he was on the list to be put down. Buster’s adopter saw his intake photo and could not get it out of her head. Next, volunteers needed a way to get Buster from Florida to New Jersey. They turned to Above and Beyond Transports to coordinate the transport using Doobert’s software. Thanks to an amazing and dedicated volunteer, Buster is now at his forever home. Volunteers and organizations can sign up for free to rescue more animals at https://www.Doobert.com.